Brien Foerster was born in Rochester, Minnesota, U.S.A. but grew up on the west coast of Canada. At age 11, he became fascinated with the Native art of the Haida native people, and began carving totem poles, and other related art forms, learning from Native teachers. After completing an Honours Bachelor of Science degree, Brien decided to take up carving and sculpture full time, at the age of 25. This included the creation of 13 full size totem poles, dugout canoes, masks, bowls, boxes and other Native style works. In 1995 he moved to Maui, Hawaii, and was hired as assistant project manager for the building of the 62 foot double hull sailing canoe (ancestor of the modern day catamaran ) Mo’okiha O Pi’ilani ( Sacred Lizard That Pierces The Heavens. ) This project lasted 2 years. There, having learned how to make Hawaiian outrigger canoe paddles from master carver Keola Sequiera, he started an online outrigger paddle business, which flourished internationally. Peru became his next major area of interest. The study of the Inca culture led to his writing A Brief History Of The Incas which is available on his website, www.hiddenincatours.com. 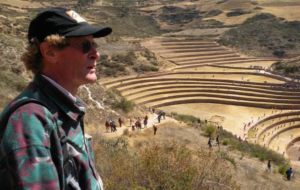 He has become an authority on the megalithic works of South America and the perplexing ancient Elongated Headed people of the area, and divides his time between Paracas and Cusco, Peru.